In a bizarre incident, a donkey was painted with black stripes and disguised as a zebra on display in a zoo in Cairo. 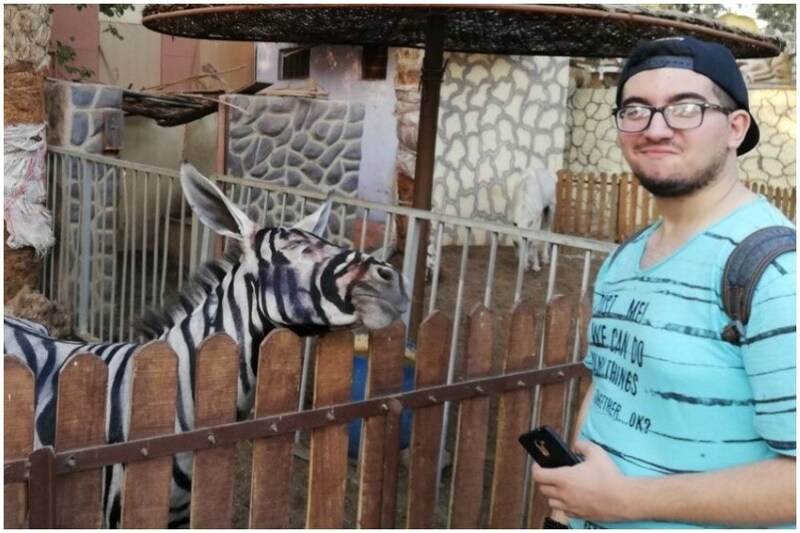 The fraud was caught by student Mahmoud A. Sarhan who was visiting a newly opened animal park called International Garden municipal park in Egypt’s capital Cairo. The images posted by Mahmoud on his Facebook account, depcited what many were convinced was not a zebra. Apart from the obviously smudged paint on theanimal’s face, the alleged zebra also had droopy donkey-like ears and was considerably smaller an average zebra. Some also commented on the size of it;s ears – zebras have smaller ears than the ones on the ‘zebra’ in the Cairo zoo. Mahmoud surmised that the zoo authorities had painted two donkeys and propped it as zebras to attract visitors. According to the Facebook post, the photo was part of documentation for ‘wild municipal reconstruction’. The image obviously went viral and social media was soon in splits, trying to figure out what breed the animal really was. However, according to reports zoo authorities refused to accept the charge, claiming that the animals were indeed zebras. While there was no way to find out if the zebras were fake or genuine, social media had a good time deconstructing the mystery. Some people recalled previous experiences in Cairo zoo. Fake zebras have appeared in zoos before too. In 2009, authorities at a Gaza zoo painted donkeys to look like zebras. All the animals in the Marah Land zoo in Gaza were smuggled in to escape the Israeli blockade. According to a BBC report, the owner of the zoo had claimed that smuggling in real zebras would have cost about 40,000 USD more.